The event begins at 9.00am and is free and open to the public; in the case of inclement weather, the event will be held on Sunday, May 1. 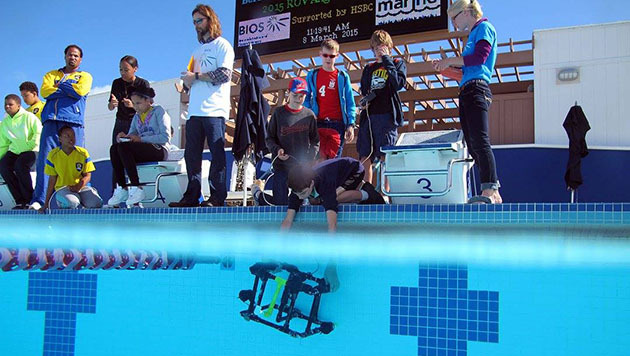 Clearwater Middle School competes in the obstacle course at the 2015 ROV Challenge hosted by BIOS. A spokesperson said, “Globally, HSBC focuses on supporting educational initiatives which promote learning about the environment. In Bermuda, HSBC has partnered with BIOS for the past 2 years in support of the MARINE Programme and the ROV Challenge, which teaches young people about the world’s oceans, and the importance of preserving them. “It also supports education goals associated with science, technology, engineering, and mathematics, known as the STEM fields. “For the 2016 piloting challenge, MARINE will be partnering with the Marine Advanced Technology Education [MATE] center to host a regional challenge. Students will be competing at two levels, as designated by MATE. “Beginners will compete at the Scout level and more advanced students at the Navigator level. Students will complete the event on the same challenge course as other MATE regional partners internationally.